dance.net - How to jazz up these buckles (10173113) - Read article: Ballet, Jazz, Modern, Hip Hop, Tap, Irish, Disco, Twirling, Cheer: Photos, Chat, Games, Jobs, Events! 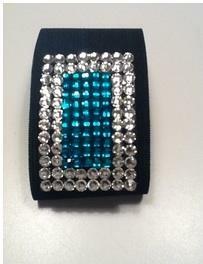 I'm looking at jazzing up a pair of these buckles to match my dress. I'm looking at adding fine glitter to the metal part of the buckle, but I'm not sure if I should go with silver, blue or a mix of the 2? Also what sort of glue would be appropriate to make the glitter stick to the metal? I am all for bling! but realize that glitter or stones on your buckles will draw more attention to your feet. Do you have wonderful turn out and cross? Then bring on the attention to it! But if your turn out is not so great you might not want to draw extra attention, if you know what I mean.